When it comes to health research, a key advantage of the National Health Service is its scale. Researchers working in the NHS have potential access to significant quantities of health information and large patient-recruited clinical trials. For instance, in 2016/17 over 665,000 participants were recruited into clinical trial studies. This means the NHS can produce research outcomes of a scale and validity that others cannot. At the same time this requires considerable coordination. Health research is innately collaborative, both in the research itself and in the funding systems that allow the research to take place. The R&D Directors Group allows coordination among those responsible for research in the UK’s most research-intensive trusts, and close communication with funders. 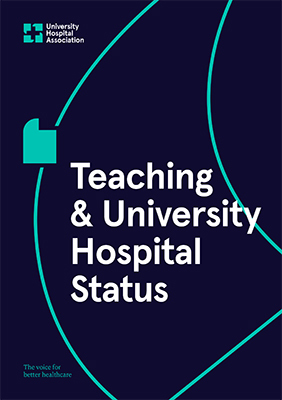 In 2013-2017, over 50% of all National Institute for Health Research-funded clinical trials were carried out by university hospital trusts. As well as clinical research funding, the group frequently works on the development of performance indicators and on partnerships between academia and healthcare. The current chair of the R&D Directors Group is Professor David Wynick, Joint Director of Research at University Hospitals Bristol NHS Foundation Trust and North Bristol NHS Trust. The group is supported by Andy Collier, Policy Officer at UHA.